No tool assembly for easy transport and storage. Built-in hygienic opening, hand-held shower holder, and carry handles. 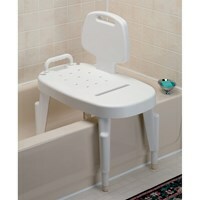 Universal Bath Bench Compact design fits into virtually every tub and shower--whether at home or away. Leg levelers ensure custom, firm fit with any tub or shower floor without wobble. Built-in hygienic opening, hand-held shower holder, and carry handles. Sturdy, monoblock construction has no metal parts to corrode. Assembles and disassembles quickly without tools for easy transport and storage. Choose with or without backrest. Weight capacity:400 lbs.